The Hindu devotees across India are hosting a chain of festivities right now. Soon after the celebration of the onset of the spring season, individuals are now excited to observe Hanuman Jayanti 2019. As the name suggests, it is the birth anniversary of Hindu god Lord Hanuman, who is believed to be the 11th reincarnation of Hindu Lord Shiva. This year, Hanuman Jayanti is celebrated on April 19, according to the Hindu calendar. As the deity is considered to be immensely significant amongst the Hindu worshippers, people on Hanuman Jayanti engage themselves in a long day fast and reciting devotional bhajans and Hanuman Chalisa. Hence, on the auspicious occasion, we have compiled holy Hanuman Jayanti 2019 bhajan videos and Lord Hanuman Chalisa, voiced by Hariharan, Lata Mangeshkar and other musical gems that you must play on the birth anniversary of Lord Hanuman. Is the Distance to Sun From Earth Found in Hanuman Chalisa's Chaupai; Read Lyrics. Lord Hanuman is an essential character in the Hindu epic Ramayana and a great follower of Lord Ram and Goddess Sita. His role in Lord Rama’s journey to free his wife from the demon king Ravana, is amicable and will forever be cherished among his devotees. Celebrated on the 15th day of the Shukla Paksha, in the Hindu month of Chaitra, Hanuman Jayanti is considered to be a significant event for the devotees. On the celebrated of his birth anniversary, Lord Hanuman bhajans are listened and sung unanimously by the devotees at various Hindu temples. Here are the devotional Hanuman Jayanti bhajans and Chalisa that you can sing on the holy day of Lord Hanuman’s birth anniversary. Shree Hanuman Chalisa Video, Lyrics in Hindi, English And Free PDF Download. This devotional compilation is voiced by iconic singers Hariom Sharan, Hariharan and Lata Mangeshkar. 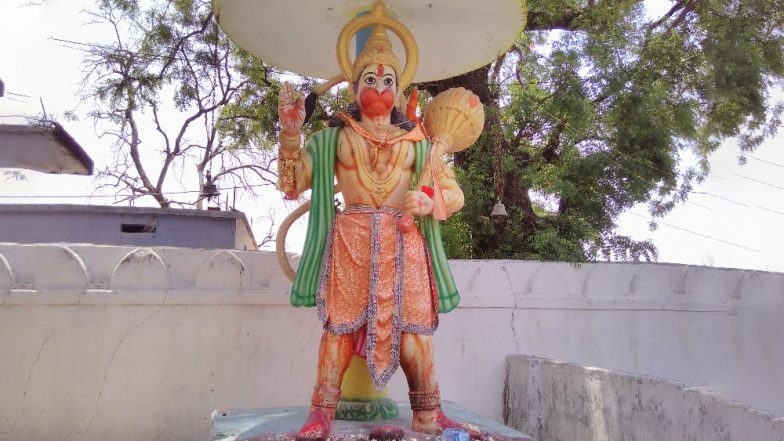 This jukebox includes Hanuman Chalisa along with devotional sings such as Sankat Mochan Hanuman Ashtak, Bajrang Baan, Hey Dukhbhanjan, Hey Bajrangbali Hanuman, Mangal Murti Maruti Nandan, Jai Jai Hanuman Gusai and Aarti Keeje Hanuman Lala ki. Listen to this super hit and devotional Shri Hanuman songs of Ram bhakt with utmost devotion and pray to Bajrang Bali to receive the grace of Shree Ram. On the auspicious occasion of Lord Hanuman Jayanti, sing along the glories of Veer Bajrang Bali. This video presents Shri Hanuman Gatha, which is dedicated to our beloved Lord Hanuman. This song is sung by Kumar Vishu, and Chandra Kamal gives the music. In this devotional track, you will be enchanted with the legendary stories and Ram Katha on the auspicious occasion of Lord Hanuman birth anniversary. Hanuman Janam Utsav is a famous festival among the Hindu devotees. He is regarded as a symbol of strength and energy. Devotees of Lord Hanuman celebrate him and seek his blessings by keeping day-long fast, engaging into devotional bhakti geet to offer him their devotions. They visit nearby Lord Hanuman temples to worship him and present religious offerings. Individuals also recite various devotional hymns and prayers like the Hanuman Chalisa and read Holy Scriptures like the Ramayana and Mahabharata.